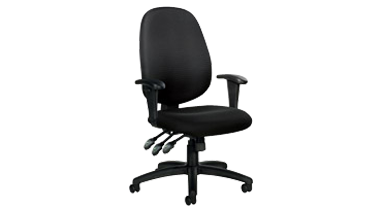 Concealed ratchet back with adjustable height, back and seat angles. Infinite position tilt-lock and tilt tension control. Height adjustable "T" arms with self-skinned, urethane armcaps. Quilt Fabric. Black. Features dual-wheel carpet casters. Medium Back. Ready to assemble.